Hair has become a conceptual touchstone for many contemporary artists. Jono Vaughan (via Skype) and FSU Art MFA ’18 Sharon Norwood will discuss the reasons hair and its styling features so prominently in their work. Interdisciplinary artist Sharon Norwood was born in Kingston, Jamaica and studied in Canada and the United States, receiving her BFA from the University of South Florida. She is currently an MFA candidate at Florida State University. In her work, Norwood explores the relationships between cultural narrative and identity. 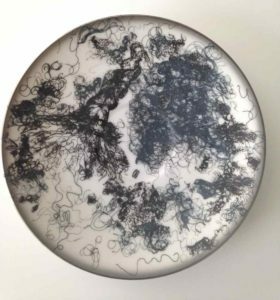 Her recent solo exhibition Split Ends, curated by Danny Olda at Kirk Ke Wang Artspace in Tampa, featured depictions of the artist’s hair on both paper and vintage porcelain, addressing issues of race and self-image. Since 2009 artist Jono Vaughan has been producing works – in a variety of media including painting, drawing and performance – that focus on hair and its role in gender and social identity. These works have been featured in New American Paintings and have been exhibited in a number of solo and group exhibitions. Vaughan was born in London, U.K. in 1977 and moved to the United States in 1985. She received a BFA from the School of Visual Arts in New York City in 1999; an MA in Teaching in the Visual Arts from The University of the Arts in Philadelphia; and in 2009 an MFA from University of South Florida in Tampa. Vaughan has recently accepted a position at Bellevue College in Washington State.